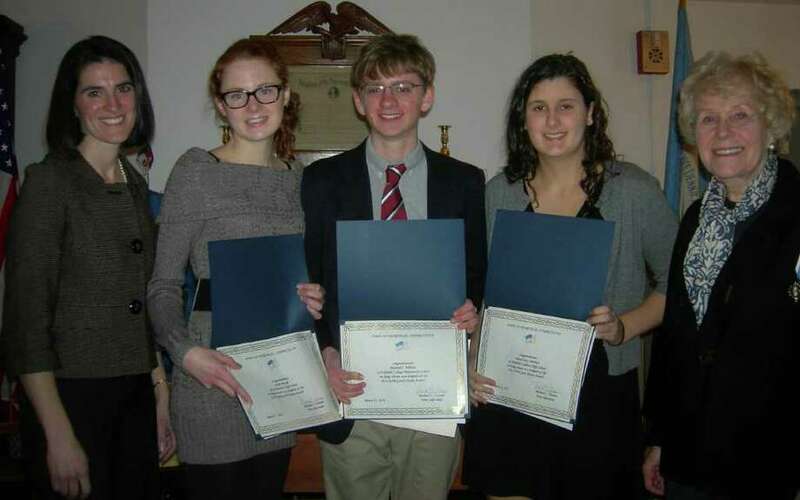 Four local high school students have been honored by the Fairfield chapter of the Daughters of the American Revolution with its annual Good Citizen certificates. The students were cited by the DAR's Eunice Dennie Burr Chapter during a ceremony March 11 at Fairfield's historic Old Academy, the DAR said in a news release. Recipients of the award are: Olivia Morrison of Fairfield Ludlowe High School, Michael Whelan of Fairfield College Preparatory School, Mary Theresa Boyle of Notre Dame High School and Gayle Powell of Joel Barlow High School. The four were selected by school counselors based on service to their schools and communities, academic standing and character, the DAR said. Powell also was named winner of the local DAR's Good Citizen Essay Contest. Selectman Cristin McCarthy Vahey, represented the town of Fairfield at the ceremony and congratulated the winners. The Daughters of the American Revolution is a women's volunteer service organization that promotes education, historic preservation and patriotism.